A floodplain is the area adjoining a stream, river or watercourse that has been or may experience flooding in a storm event. The hazards of living on or adjacent to areas that are subject to flooding are well known. Many developed areas of Chester County are subject to periodic flooding, because they were first settled by persons who needed to be close to water for transportation and water power for mills. Development has caused flood elevations and frequency to increase over the years. Regulations are usually located in the zoning ordinance, as an overlay district that places special controls over what is known as the 100-year floodplain. A one-hundred-year flood is calculated to be the elevation of floodwater expected to be equaled or exceeded every 100 years on average. The 100-year flood generally has a one percent chance of being equaled or exceeded in any single year. Although all Chester County municipalities have adopted zoning ordinances, they are also permitted to adopt flood management regulations as part of other municipal ordinances. Act 166 permits a municipality to adopt floodplain management regulations without adopting a zoning ordinance. In an effort to reduce the risk of loss of life and property, both Federal and State governments have established floodplain management and protection programs to reduce the impacts of floods. The Pennsylvania Flood Plain Management Act, commonly known as Act 166, was enacted in 1978 to help limit the loss of life and damage to property due to flooding, through the proper management of floodplain areas within Pennsylvania. The Act requires every municipality that is subject to flooding to participate in the National Flood Insurance Program (NFIP). The NFIP enables property owners to buy subsidized flood insurance in participating municipalities. 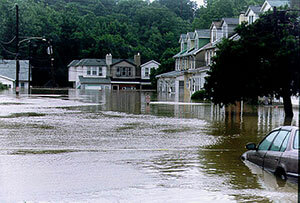 In return for making flood insurance available at lower costs for their residents, participating municipalities are required to enact floodplain management regulations that comply with the minimum requirements of the NFIP and with regulations adopted by the Pennsylvania Department of Community and Economic Development (DCED). Reduces public funding for disaster response, assistance and relief efforts. Lenders may require site-specific floodplain measurements prior to issuing loans. Floodplain protection ordinances should generally be part of an integrated natural resources protection strategy, more specifically a water resources protection strategy. These strategies should be supported by policies established in the municipality's Comprehensive Plan and be consistent with the intent and provisions of all federal and state programs, rules and regulations pertaining to floodplains. In general, ordinances should prohibit structures from being placed in floodplains such as jails, hospitals, nursing homes, and mobile home parks. However, ordinances should permit existing structures in floodplains to be flood-proofed. Floodplain regulations are typically adopted as overlay zones that correspond to the 100-year floodplain, providing additional regulations for lands within the floodplain. The actual areas of the floodplain should be determined by using the Federal Emergency Management Agency's Flood Insurance Rate Maps or by engineering studies specifically conducted to determine the exact location of a floodplain boundary. Floodplain regulations typically include a list of permitted uses and uses permitted by conditional use and special exception, as well as a list of prohibited uses. Floodplain regulations should contain provisions that separate the floodplain into two categories, the "flood fringe" and the "floodway". Regulations must accommodate reasonable use of the property in the floodplain. For example, the floodplain can be used for recreation, such as playing fields, and for utility easements. The National Flood Insurance Program and the Pennsylvania Flood Plain Management Act (1978-166) both provide the legal foundations for managing and regulating floodplains. 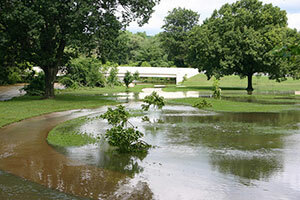 The Valley Creek Watershed Stormwater Management Plan, adopted under the provisions of the Pennsylvania Stormwater Management Act of 1978 (PA Act 167) also contains a list of stormwater management brochures. Chester County municipalities also manage and regulate floodplain areas; East Bradford Township Natural Features Protection Standards. The Pennsylvania Municipalities Planning Code (Act 247) generally allows municipalities to "…protect and promote safety…" in Section 105. More specifically, the MPC permits the protection of floodplains through language in Section 603(b)(5), indicating that "zoning ordinances may permit, prohibit, regulate, restrict and determine…protection and preservation of natural resources…".